ISLAMABAD: Pakistan and Saudi Arab on Wednesday agreed to set up a working group to promote food exports and training centre to meet job market needs in the Arab country. The decisions were taken in a high-level 11th Pak-Saudi joint-ministerial commission meeting in which Prime Minister Shahid Khaqan Abbasi met with Saudi’s Minister of Commerce and Investment Majed Abdullah Al-Qasabi. Al-Qasabi, leading a 35-member Saudi delegation, was on a visit to Pakistan to attend the commission’s meeting. The decisions, taken during the meeting, include establishment of a working group for export of halal food from Pakistan to Saudi Arabia, Saudi investment in the construction of the South-North gas pipeline, accelerated negotiations on a bilateral investment treaty and exchange of parliamentary delegations. “Pakistani side stressed the importance of cooperation between Saudi oil and gas companies to develop oil production in Pakistan including setting up of refineries,” the statement added. The meeting told that there is a Saudi royal decree to establish labor Attache in Pakistan and one of the mandates of this attachee is to approve the labor training centers to train manpower in accordance with the Saudi requirements. More than 9.6 million Pakistani workers are based in foreign countries and of which over 96 percent live in Gulf Cooperation Council’s member countries, according to Bureau of Emigration and Overseas Employment’s website. Saudi Arab is the key destination for overseas Pakistanis, contributing around six billion dollars in remittances, approximately 30 percent of total remittances. The export of overseas workers to oil producing Middle East countries has been declining for the couple of years. A delegation from the Ministry of Overseas Pakistanis and Human Resource Development is scheduled to visit Saudi Arabia early next week. “The Saudi side also agreed to visa relaxation and reduction in visa fees for Pakistanis,” the statement added. Besides, most of the Middle Eastern Muslim economies import halal food from Australia, Brazil and other non-Muslim countries. Halal food can take the country’s exports to new heights in global halal food market of $300 billion. 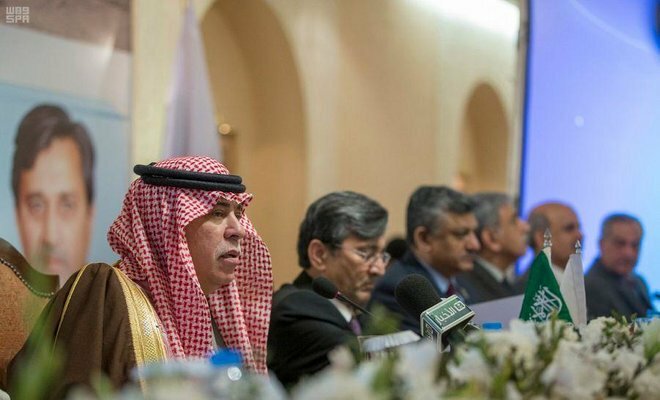 Al-Qasabi, in the ministerial meeting, emphasised the importance attached by Saudi Arabia to the special relationship with Pakistan. “During the two day session, meetings were held between the experts of the two sides on a number of issues, especially focusing on trade, commerce, energy, consular affairs, education, health and other matters of mutual interest,” another statement said. “Both sides agreed to hold exhibitions of new products in each other’s countries. First single country exhibition of Pakistan in Saudi Arabia will be held in the second half of 2018,” it added. Pakistan and Saudi Arab agreed to review and simplify the procedure of business visa issuance and rationalise business visa fee. The commission called for reactivating Pak-Saudi Joint Business Council by first quarter of 2018 followed by the first meeting of the council. A commercial attache will soon be designated in Saudi Embassy in Islamabad. It was agreed to increase cooperation in science and technology and exchange of research expertise. Pakistan offered Saudi civil aviation training courses at Civil Aviation Training Institute, Hyderabad in the field of air traffic control, communication, navigation and surveillance engineering and aviation management. Both the sides also agreed to nominate the focal persons from both sides for cooperation in the fields of trade, energy, investment, education and agriculture sectors.